Irritable Bowel Syndrome IBS, is a chronic intestinal disorder that results in diarrhoea, constipation, and abdominal pain. These symptoms usually appear after a meal is consumed and can sometimes be controlled by diet changes. Since different foods affect different people, and not all foods will trigger the same IBS symptoms in all individuals, it is best to track your symptoms and current diet before making any changes. The most effective way to do this is to keep a food and symptom diary. Using a blank notebook spend two weeks writing down everything you eat each day and the symptoms that follow those meals. Make sure to include snacks, beverages and ingredients in each entry. After two weeks review your diary entries and highlight the meals or ingredients that resulted in Irritable Bowel Syndrome symptoms when consumed. For example, if you noticed that you suffered from diarrhoea after every meal that contained a dairy product then you will want to add dairy products to your list of likely IBS triggers. Once you have a comprehensive list of suspected triggers you will need to choose one and eliminate that single item from your diet for a week. 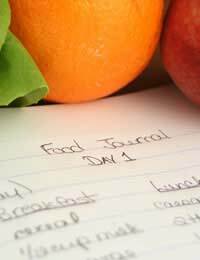 Again, during this week, make sure that you track your symptoms and meals in the food diary. For the second week, reintroduce the first eliminated food and eliminate a different suspected trigger food, like wheat products, from your diet. After a few weeks of elimination and testing you should have a fairly descriptive picture of which foods you can and cannot eat when attempting to control your IBS symptoms. Once your individual IBS diet is complete you can use the results to tailor your menu choices and also share the information with your doctor so that he or she can further personalise your Irritable Bowel Syndrome treatment plan. Although the completion of a food diary is the most accurate way to determine which food items are more likely to cause IBS symptoms for you personally, there are a few food items that are known to cause IBS symptoms in a large majority of people. Knowing which foods are included on this list can help you determine which foods to start with in your elimination efforts. Dairy Products. Food items such as milk, cream, sour cream and ice cream, contain lactose. This naturally occurring sugar can be hard for some individuals to digest and can cause symptoms such as diarrhoea, constipation and cramping in sufferers of IBS. However, some dairy products like yoghurt, cheese and buttermilk, may not trigger IBS symptoms since the bacteria found in these items converts the lactose during the processing of these foods. Wheat Products. Although fibre rich foods can help lessen the occurrence of constipation in some individuals with IBS, the wheat found in breads, pancake batters, cereals and dessert items, can also trigger or worsen other IBS symptoms. Certain Vegetables. Some vegetables, such as beans, cabbage, broccoli and onions, are known to cause excess gas in a healthy digestive system. However, when these foods are consumed by individuals with Irritable Bowel Syndrome the production of gas can increase and can also be accompanied by severe abdominal cramping. Citrus Fruits. Although the exact reason is unclear, many IBS sufferers report increased symptoms after consuming fruits like lemons, limes, oranges and grapefruits. Sugar and Sugar Substitutes. Individuals with IBS may have a hard time digesting the fructose that makes up sugar and as a result will likely suffer from excess gas, constipation and diarrhoea. The same is true of artificial sweeteners like sorbitiol, since the compound is not digestible. Spicy Foods. Some spicy foods are known to increase activity in the digestive system after consumption. For individuals with IBS this can mean increased episodes of diarrhoea and abdominal cramping. Aside from tracking your dietary intake and avoiding common food triggers, there are other ways that you can adapt your diet to control the symptoms of IBS. Start by increasing your water intake to at least eight 8-ounce glasses each day. This will aid in digestion and help keep your body hydrated during bouts of diarrhoea. Also try to increase your fibre intake to help ward off constipation. If fibre-containing foods trigger IBS symptoms for you, try getting your fibre through supplements instead. Finally, avoid eating large meals and attempt to break your eating habits up into numerous smaller meals throughout the day. Large meals are hard to digest and result in system overload. Eating smaller, more frequent meals can help reduce the occurrence of diarrhoea and abdominal cramping. Although there is no known cure for Irritable Bowel Syndrome the symptoms of this disorder can be controlled with the proper diet. By tracking your meals, eliminating symptom triggers and discussing your diet plans with your doctor, you can lessen the occurrence of symptoms and enjoy your favourite meals in moderation without worry. I have suffered from stomach cramps, heartburn, indigestion and other random stomach pains for nearly five years now. I have been forced to permanently give up caffeine, fizzy drinks, fruit juice, squash and acidic food. The doctors have done precisely nothing about it so far except patronize me and give me liquid Gaviscon. Could it be IBS and if so what can I do about it? does anyone experience pain in the kidney and lower back when they are having ibs pains. I have been told for several yrs I have IBS and must learn to deal with it by GPs. I have a lot of sleepless nights thanks to this excrutating pain, like continous cramps, spasams never goes, always there more severe at times. Never know what to eat, hurts more when I empty my bowels. Bowels have been loose and bloody recently, I hurt all over and generally feel unwell. At times stomach pain is such agony I can't walk I want to curl up and cry. This has been a good help and our appreciation for the easily understandable language and guidance.